We are no longer living on a physical realm influenced by a spiritual realm. 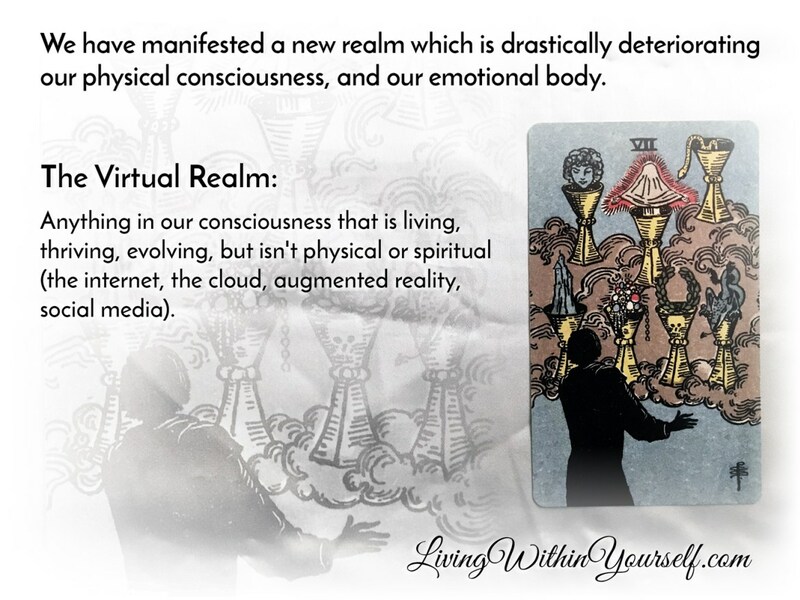 We are now living on a physical realm, influenced by a spiritual realm, and consumed by a virtual realm. We have entered into a new era, as we have literally manifested a NEW REALM which is drastically deteriorating our physical consciousness; the Virtual Realm (anything in our consciousness that is living, thriving, evolving, but isn’t physical or spiritual: augmented reality, the internet, the cloud, social media, etc.) has become our dominant emotional trigger. Mindfulness meditation will help us reconnect with our emotional body and remain grounded on the physical realm. We begin this day-long practice by contemplating on each of our physical senses for 10 minutes (they can be spread out throughout the day). When we are not focusing on a physical sense, we must remain mindful of everything we do, and keep our daily pace at a minimum; we must be conscious of the physical world around us, and appreciate every little detail in each of our experiences. At the end of the day, after we have completed contemplating on each of our physical senses, we can lie on our back with our hands above our head (in prayer form) for a period of 10 minutes. Our palms should not be touching, our legs should not be crossed, our arms should be parallel to the ground, and we should maintain equal breaths (inhalation and exhalation). We must focus on the energy building up between our palms, and as we feel the energy amplifying, we should start visualizing a bright white light pulsating between our palms. Our left palm, having the receptive female qualities of the moon, water, and earth, acts as the input; it allows our physical body to receive spiritual energies. Our right palm, having the projective masculine qualities of the sun, fire, and air, acts as the output; it allows our physical body to release spiritual energies. The spiritual energy released and received through our palms will create a cycle of regenerative energy throughout our bodies (physical, mental, emotional, and spiritual) and restore a healthy balance. Sight: Contemplating as we stare at a burning candle, clouds, a breaking wave, etc. Smell: Contemplating as we smell a fresh cup of coffee, flowers, food, etc. Taste: Contemplating as we taste the flavors of spices, honey, mint, etc. Hearing: Contemplating as we listen to the sound of a bell, a stream of water, singing birds, etc. Touch: Contemplating as we feel the texture and temperature of sand, fur, grass, etc. Vestibular Equilibrium and Proprioception (gravity, movement, balance, muscle force and effort): Contemplating on our body as we run, lie down, hold a yoga pose, etc.